April 5, 2019 — DELTA BINGO MISSISSAUGA HAS JUST ANNOUNCED THE RETURN OF “BLOCKBUSTER BINGO” EVENTS FOR APRIL — BY POPULAR DEMAND! Delta Mississauga tried something new in March, and by popular demand, they are happy to announce the return of Blockbuster Bingo Nights” on Friday, April 26 and Saturday, April 27 — featuring a $23,000 MUST-GO Progam! April 1, 2019 — IT’S NO JOKE, PEOPLE WIN BIG PLAYING BINGO EVERY SINGLE DAY! And you’re supporting local not-for-profit charitable groups who do good work, important work, in our communities. The nice weather is coming and, while it’s not terribly important right now, we hope you’ll remember that Bingo and Gaming Centres who advertise in Bingo Player have air-conditioned facilities, lots of parking, friendly staff, and great Bingo opportunities. Mississauga’s Delta Bingo offers a great weekend Bingo opportunity every Friday and Saturday night 7 pm Session, with a FREE $20,000 Progressive, with a $500 Consolation Prize and a “Must-Go” on Saturday, April 27. Don’t miss the $12,000 MUST-GO on Friday and Saturday 7 pm Sessions from Friday, March 1 through Saturday, March 23. Did you know Delta Mississauga offer at least $5,500 in prizes every Session ~ there’s up to $70,000 available every Session ~ February 2019 prizes exceeded $1,275,000!!!! That’s well over a million dollars in prizes awarded in one month. The “ALL WINNERS” promotion runs from April 1 through Tuesday, April 30 when Special Games will be played with prizes of $1,000 (at 1 pm, 4 pm and 10 pm) and $3,000 at the 7 pm Session. Delta Mississauga will have an Extra 10am Session on Good Friday, April 19. Delta Mississauga also continues the expanded “DOLLAR DAY” Special available at 10 am Sessions on Saturdays (6, 13, 20, 27) and continuing on every Wednesday Session. Finally, the “$50 The Works” Package is now available on more Sessions, including all Sessions on Sundays and Thursdays and NEW ON FRIDAY & SATURDAY 1 PM & 4 PM SESSIONS through the month. CLICK HERE FOR MORE! Delta Bingo Downsview is pleased to offer “FREE EASTER DAUBERS” at all Sessions on Easter Sunday, April 21. Downsview continues their very popular “SATURDAY NIGHT SPECIAL“, which offers a $21,000 Prize Board — which includes a $5,000 Must Go Super Jackpot and $50 Packages — only at the 7 pm Session. Downsview’s “ALL WINNERS” promotion runs April 1 through 28, with a special $1,000 All Winners Game to be played at all Sessions on the Monday, April 29. The NEW “8 BALL BONUS POT” is a hit, as are “WACKY WEDNESDAYS” with the added $2,000 to the 10 am & 10 pm programs, which also include Big “Z” for $1,500 / Delta Jackpot for $1,500 / Final Jackpot $2,000!! Downsview also offers a “FREE $2,000 GAME” at every Tuesday and Thursday 7 pm Session. CLICK HERE FOR MORE! Burlington’s Bingo Connection has your “FREE EASTER DAUBER” at all Sessions on Good Friday, April 19 (while supplies last). Bingo Connection is also pleased to continue their popular “RED BALL PROGRESSIVE” playing daily at 12:30 pm, 6:45 pm and 9:45 pm. You can win huge with their up to $10,000 “U PIK-‘EM” and up to $7,000 on “CATCH THE STAR”. There’s even more ways to win with the $9,000 Triple Decker, a $5,000 Encore (played at all Sessions except Breakfast Sessions), and three amazing “LETTER S” opportunities with Jackpots that grow ’til they go! There’s a $3,000 RAPID FIRE BONUS GAME every Session. In their area, these are some of the best Jackpots in the area! CLICK HERE FOR MORE! 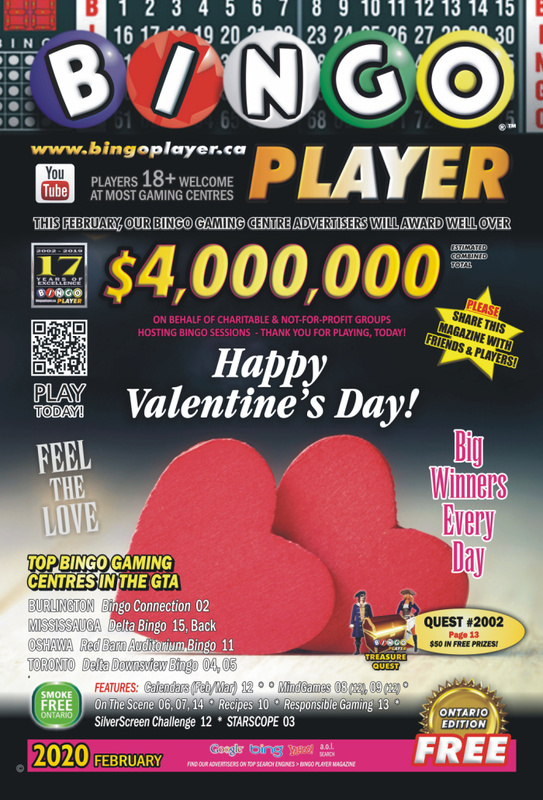 March 28, 2019 — OUR NEW APRIL 2019 ISSUE OF BINGO PLAYER MAGAZINE IS NOW ON NEWSSTANDS AND IN PARTICIPATING BINGO HALLS & GAMING CENTRES!! March 1, 2019 — THANK YOU TO EVERYONE WHO BRAVES THE ELEMENTS TO SUPPORT LOCAL CHARITIES WHEN PLAYING BINGO! As last year ended, we were all wondering if winter would arrive. In the GTA, it definitely came as 2019 began and has stuck around. As we include in our printed magazines during winter season, we hope you travel safely and dress for the weather. Mississauga’s Delta Bingo celebrates their Anniversary Saturday, March 2 with Free Food & Drink all day. They also have some amazing changes for March, including “Blockbuster Bingo Nights” on Friday, March 29 and Saturday, March 30 — featuring a $23,000 MUST-GO Progam! Also, on Every Friday and Saturday night 7 pm Session, there’s a FREE $20,000 Progressive, with a $500 Consolation Prize and a “Must-Go” on Saturday, March 30. Don’t miss the $12,000 MUST-GO on Friday and Saturday 7 pm Sessions from Friday, March 1 through Saturday, March 23. Did you know Delta Mississauga offer at least $5,500 in prizes every Session ~ there’s up to $70,000 available every Session ~ January 2019 prizes exceeded $1,350,000!!!! That’s now well over a million dollars in prizes awarded in one month. The “ALL WINNERS” promotion runs from March 1 through Thursday, March 28 when Special Games will be played with prizes of $1,000 (at 1 pm, 4 pm and 10 pm) and $3,000 at the 7 pm Session. Delta Mississauga also offers their Annual “$34,000 TOURNAMENT OF CHAMPIONS” which runs from Friday, March 1 through Saturday, March 30 when a Special $34,000 Program runs after the 10 pm Session (start time approximately 1 am). Extra V.I.P. Draws also available for this event. If that’s not enough, Delta Mississauga has expanded their “DOLLAR DAY” Special to 10 am Sessions on Saturdays (2, 9, 13, 20, 27) and continuing on every Wednesday Session. Finally, the “$50 The Works” Package is now available on more Sessions, including all Sessions on Sundays and Thursdays and NEW ON FRIDAY & SATURDAY 1 PM & 4 PM SESSIONS through the month. CLICK HERE FOR MORE! Delta Bingo Downsview is pleased to offer “FREE ST. PATRICK’S DAY DABBERS” at all Sessions on Sunday, March 17. Downsview is pleased to continue their very popular “SATURDAY NIGHT SPECIAL“, which offers a $21,000 Prize Board — which includes a $5,000 Must Go Super Jackpot and $50 Packages — only at the 7 pm Session. Downsview’s “ALL WINNERS” promotion runs March 1 through 24, with a special $1,000 All Winners Game to be played at all Sessions on the March 25. The NEW “8 BALL BONUS POT” is a hit, as are “WACKY WEDNESDAYS” and the added $2,000 to the 10 am & 10 pm programs, which also include Big “Z” for $1,500 / Delta Jackpot for $1,500 / Final Jackpot $2,000!! Downsview also offers a “FREE $2,000 GAME” at every Tuesday and Thursday 7 pm Session. CLICK HERE FOR MORE! Burlington’s Bingo Connection has your “FREE ST. PATRICK’S DAY DABBER” at all Sessions on Sunday, March 17 (while supplies last). Bingo Connection is also pleased to continue their popular “RED BALL PROGRESSIVE” playing daily at 12:30 pm, 6:45 pm and 9:45 pm. You can win huge with their up to $10,000 “U PIK-‘EM” and up to $7,000 on “CATCH THE STAR”. There’s even more ways to win with the $9,000 Triple Decker, a $5,000 Encore (played at all Sessions except Breakfast Sessions), and three amazing “LETTER S” opportunities with Jackpots that grow ’til they go! There’s a $3,000 RAPID FIRE BONUS GAME every Session. In their area, these are some of the best Jackpots in the area! CLICK HERE FOR MORE! February 1, 2019 — PEOPLE LOVE TO PLAY BINGO FOR REASONS OTHER THAN TRYING TO WIN A BIG JACKPOT! Charitable Gaming is, after all, about charitable and not-for-profit groups in our communities who do fantastic work helping people of all ages. Whether it’s helping Seniors or teaching children how to grow, Bingo supports the best efforts and the best intentions. These important groups keep our communities strong, vital, thriving and on point. And sure, it IS amazing when someone wins big. It happens every day at your favourite Bingo and Gaming Centre in Ontario. Please support our advertisers and show them the love! Mississauga’s Delta Bingo wants to remind you that they offer at least $5,500 in prizes every Session ~ there’s up to $70,000 available every Session ~ December 2018 prizes totaled over $1,200,000!!!! That’s over a million dollars in prizes awarded in one month. Check out their February specials, including a NEW “BONUS BINGO BALLS” promotion which runs from February 1st through the 23rd — with special Draws on the 23rd offering prizes from $1,000 to $5,000. They will also offer an “EXTRA FAMILY DAY” SESSION on Monday, February 18th. The “ALL WINNERS” promotion runs from February 1st through the 28th — on the 28th they offer a special game with prizes of $1,000 (at 1pm, 4pm and 10pm) and $3,000 at the 7pm Session. Check out their “$12,000 MUST-GO FRIDAY & SATURDAY” opportunity at every Friday & Saturday 7pm Session through February. “PLAYERS PROGRESSIVE” offers the chance to win up to $15,000 and the “SUPER EIGHT BALL” also offers the chance to win up to $15,000. Delta Mississauga also continues their popular “DOLLAR DAY” Special on every Wednesday Session. Finally, if your feeling peckish, remember “FREE FOOD TUESDAY” happens at every Session on February 26th (while supplies last). CLICK HERE FOR MORE! Delta Bingo Downsview is pleased to offer “FREE VALENTINE’S DAY DABBERS” at all Sessions on Thursday, February 14th and will offer an “EXTRA 1am SESSION” on Family Day, Monday, February 18th (this Session will follow the Feb. 17th 10pm Session). Downsview is thrilled to continue to offer a big opportunity, their “SATURDAY NIGHT SPECIAL“, which offers a $21,000 Prize Board (which includes a $5,000 Must Go Super Jackpot) and $50 Packages — only at the 7pm Session. Downsview’s “ALL WINNERS” promotion runs February 1st through the 24th, with a special $1,000 Game to be played at all Sessions on the February 25th. There are some new opportunities for you in February, too! A NEW “8 BALL BONUS POT” is now playing. “WACKY WEDNESDAYS” has added $2,000 to the 10am and 10pm programs, which also include Big “Z” for $1,500 / Delta Jackpot for $1,500 / Final Jackpot $2,000!! Downsview also offers a “FREE $2,000 GAME” at every Tuesday and Thursday 7pm Session. CLICK HERE FOR MORE! Burlington’s Bingo Connection offers their “RED BALL PROGRESSIVE” playing daily at 12:30pm, 6:45pm and 9:45pm. You can win huge with their up to $10,000 “U PIK-‘EM” and up to $7,000 on “CATCH THE STAR”. There’s even more ways to win with the $9,000 Triple Decker, a $5,000 Encore (played at all Sessions except Breakfast Sessions), and three amazing “LETTER S” opportunities with Jackpots that grow ’til they go! There’s a $3,000 RAPID FIRE BONUS GAME every Session. In their area, these are some of the best Jackpots around! CLICK HERE FOR MORE! January 1, 2019 — START YOUR NEW YEAR OFF RIGHT. PLAY BINGO AND YOU MIGHT WIN A BUNDLE!! Bingo is, and always has been, an important part of raising funds for charitable and not-for-profit groups in Ontario. Mississauga’s Delta Bingo continues their popular “DOLLAR DAY” Special on every Wednesday Session, plus they’ve got up to $27,000 in prizes to be won on Friday and Saturday 7pm Sessions through January. CLICK HERE FOR MORE! Delta Bingo Downsview continues their popular “FREE BINGO GAME“, which plays at every Saturday 7pm Session. Win up to $20,000, or a $5,000 Guaranteed Consolation Prize. CLICK HERE FOR MORE! Burlington’s Bingo Connection offers their “RED BALL PROGRESSIVE” and up to $10,000 on “U PIK-‘EM“. CLICK HERE FOR MORE!